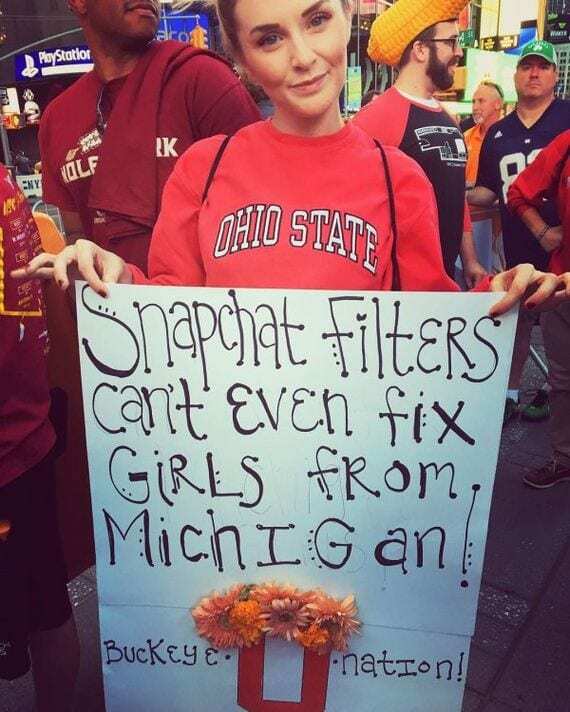 Besides doing better than either Michigan State University or the University of Michigan in sports, Ohio State University’s girls are also just plain hotter. 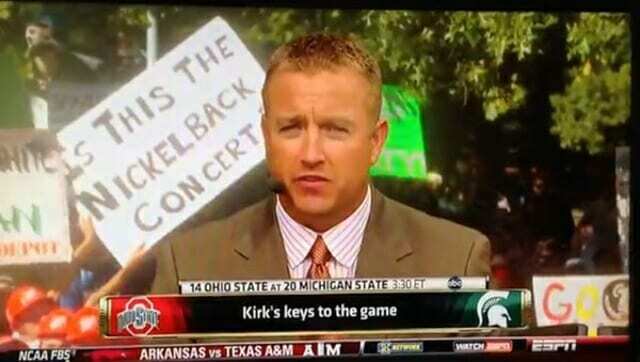 At least that’s what this Buckeye fan thinks, in any case. Whether or not OSU boasts some of the best-looking girls on any campus is up for dispute — what is clear is that this diss hit college girls where it hurts. We just wonder if any fan of either Michigan State or the University of Michigan responded, and how. 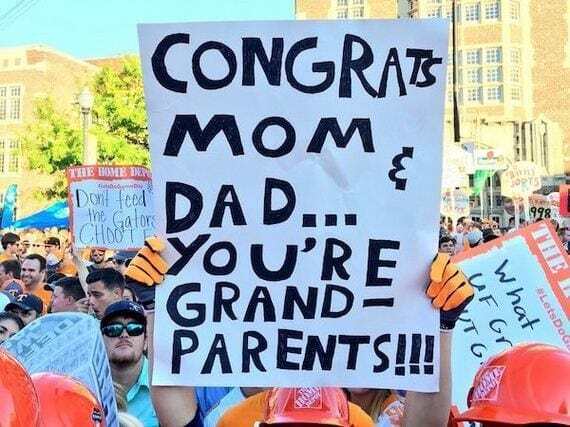 Most of these signs talk about something to do with football, but this person decided that GameDay coming to their school was the perfect opportunity to break the news to mom and dad. Imagine waking up on Saturday morning to watch your old alma mater play, which happens to be where your kid goes to school, only to be hit by the surprising news that you have a new member of the family. Now you have to pay for tuition as well as diapers! College is known for many things, some of them contradictory. The very real and infamous Freshman 15, for example, stands in stark contrast to the health and fitness that ought to be emphasized by college football games. The effects of unhealthy eating and drinking habits by students struggling to stay ahead in their studies was pointed out by this student, who sought company in unwinding on gameday. What’s beautiful is that this person didn’t let body image get in the way of their having a good time. 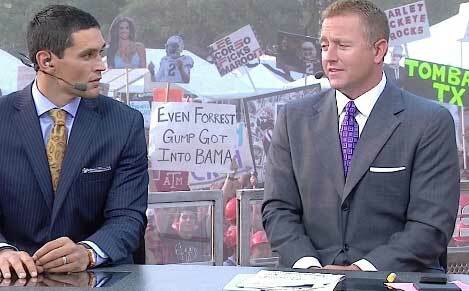 No matter where the fan is from holding up this sign, this is definitely a quip we can all get behind. The Sooner Schooner, the symbol of the University of Oklahoma, is one of the most famous and popular mascots out there. They even parade it around their stadium for all the world to see, which damns them even further. 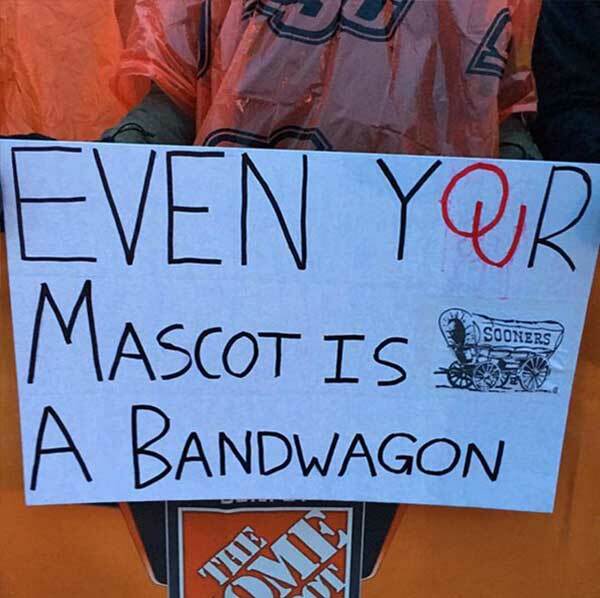 So if you’re an Oklahoma fan, you need to be ready to endure this insult, because how can you deny it? Sometimes the insults hurled between the teams hit below the belt, like this sign that pokes fun at the female student body at Stanford. 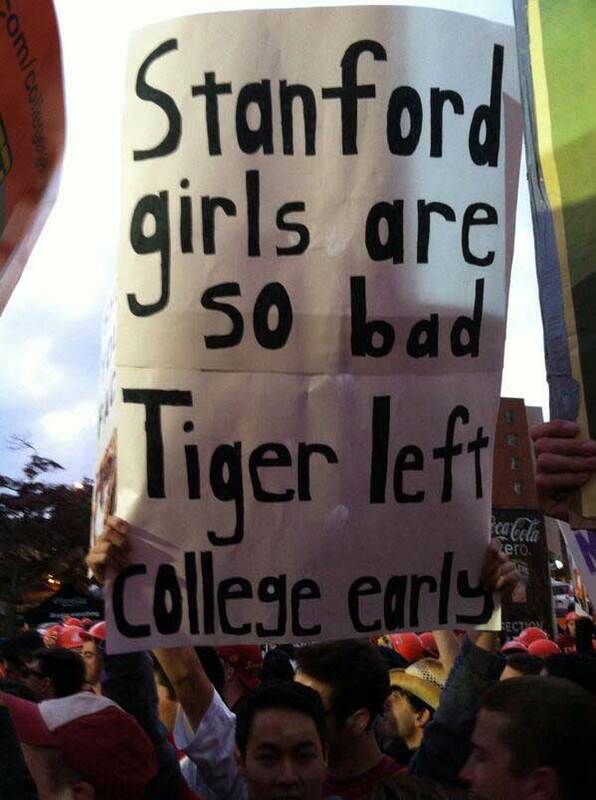 It suggests that the real reason Tiger Woods ended his college career to go professional wasn’t his incredible potential waiting to be realized in professional golf, but the fact that Stanford girls are terrible. This college football fan appears to sincerely believe this is the real reason behind his early departure from amateur golfing. Indeed, Woods later admitted to his womanizing ways. 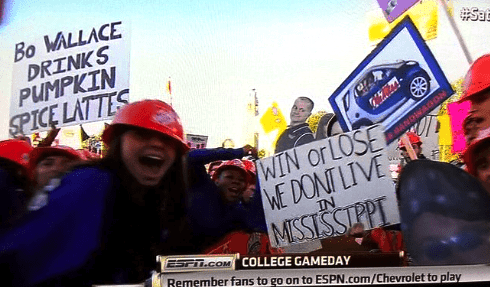 The great thing about ESPN GameDay is that no one seems to care about anything, just so long as their sign gets coverage nationwide. 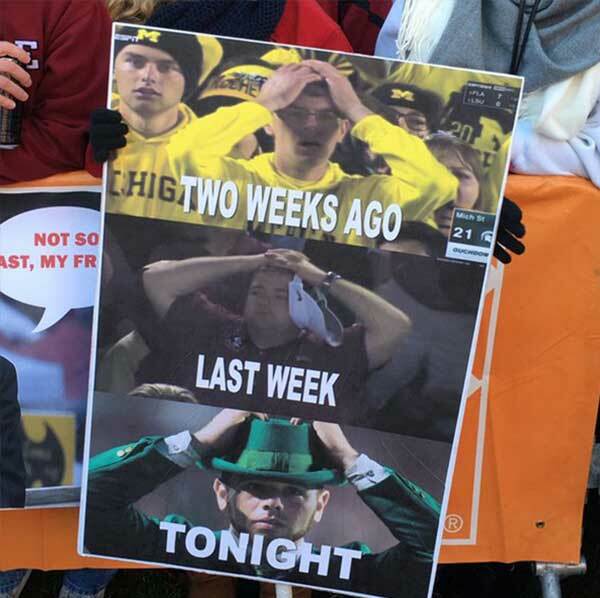 We’re not so sure if this is due to the ecstasy of the prospect of being on national television or the Irish coffee she had while tailgating, but judging by the misspelling of such an easy word on the sign, it’s “probaly” the latter. 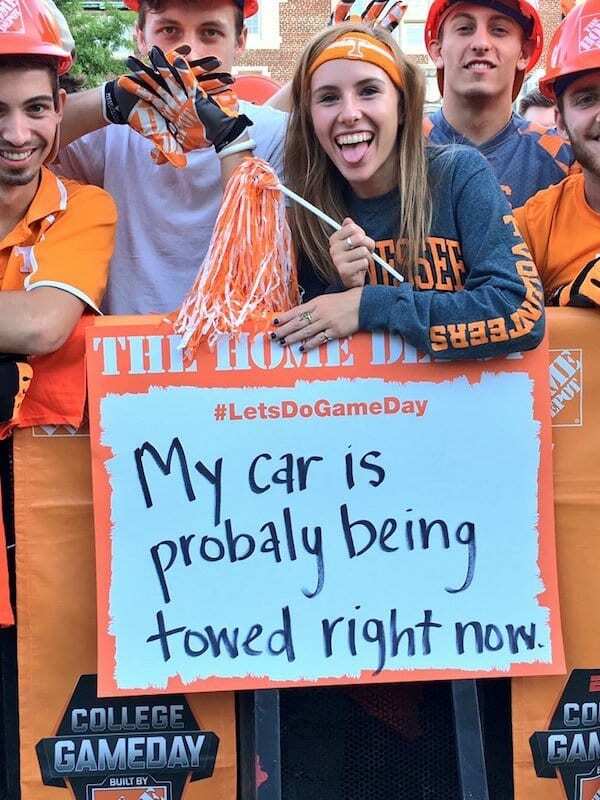 Or maybe Tennessee’s student body is just as illiterate as those from Alabama. 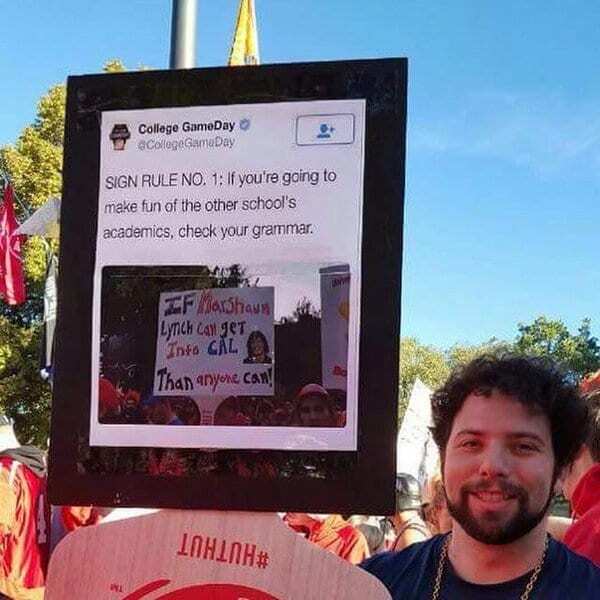 College GameDay has become a platform for some of the greatest quips between fans to be broadcast to a wider audience. As these collegiate athletic competitions have pitted schools of higher learning against each other, it’s only natural that fans will insult the intelligence of the opposing student bodies. But beware of grammar and spelling mistakes, folks! 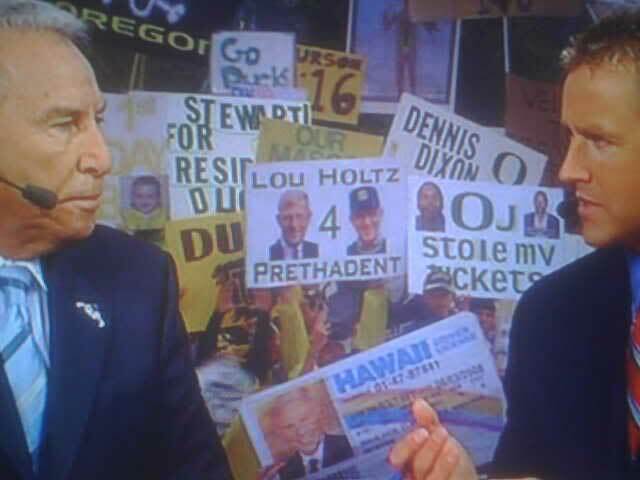 College GameDay will find you and shame you before the rest of the nation, as evidenced by the sign this UC Berkeley fan is holding up. Out of all the heated rivalries in college football, America’s favorite is doubtlessly the annual Army-Navy game. Besides being a hotly-contested game between the rivals and one of the greatest traditions in the sport, the spirit of sportsmanship and camaraderie displayed year after year is a touching testament to the fighting spirit of our armed forces. 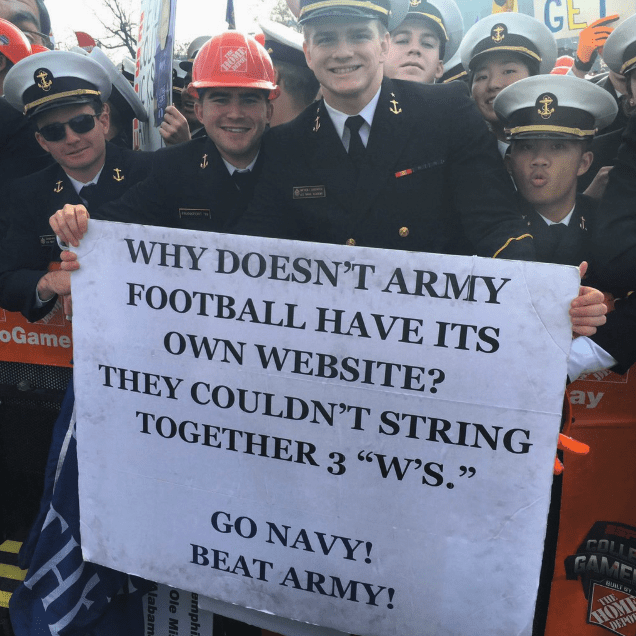 Unfortunately for these Navy fans, they were proven wrong this past season when the army won the series for the third consecutive year. 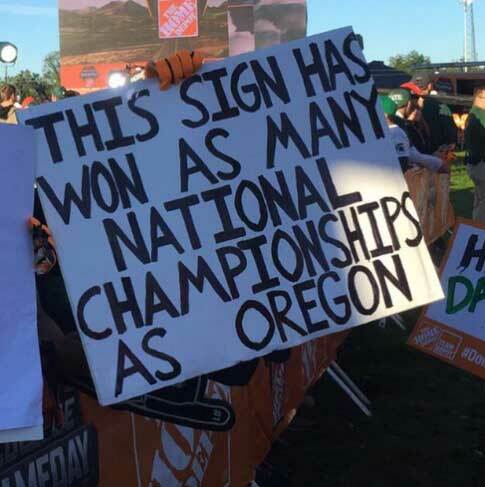 The truth stated on the sign is a slap to the face of any fan of the Oregon Ducks, especially considering their loss to Ohio State for the 2014 National Championship game. Oregon went up against an undefeated Florida State team in a fantastic display of raw talent, crushing the Seminoles. Sadly, a similarly crushing loss to OSU followed this performance. This might not be your opinion if you are a fan of OSU, but most people will agree the Buckeyes have enough championships. There are far too many bowls around, as any college football fan will tell you, meaning that most of them don’t actually matter for anything. These haters have picked up on this fact and are using it to disrespect Baylor University, much to the Bears’ chagrin. 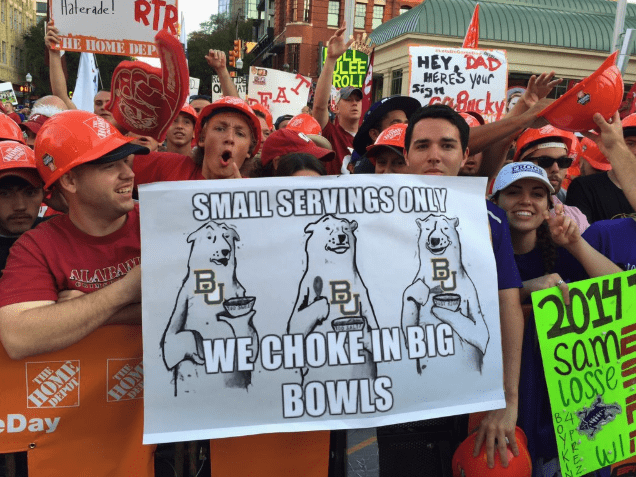 For even though the Baylor Bears have won several bowls, according to those holding up this sign none of them matter. And the ones that did matter? Unfortunately, those were the ones that they lost. Sad, but true. Even though Oregon doesn’t have a championship, none of their cities seem to be failing as bad as Detroit city. This appears to be a dig specifically at the University of Michigan, which has quite a number of championships, although it might also be directed at Michigan State, which also has won quite a few. What people might not know is that the University of Michigan wasn’t always located at its current address in Ann Arbor; it was actually founded in Detroit before it moved. Is There Truth To The Stereotype? 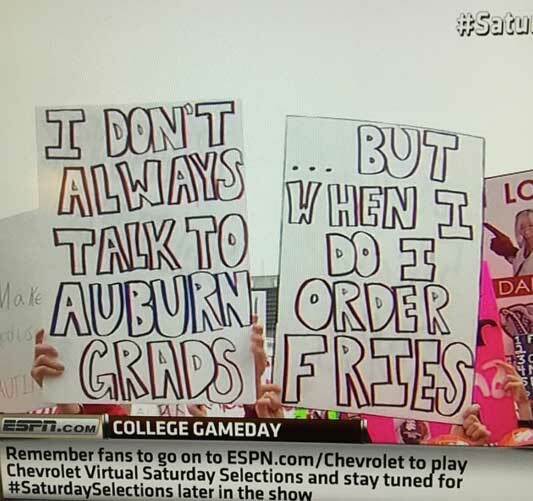 There’s nothing better than two like-minded fans coming together and putting together a classic message such as this, which pokes fun at the intelligence of Auburn’s student body. If you’re an Auburn fan and are still trying to understand what’s written here, maybe it’s best to keep silent… In fact, the alleged stupidity of Auburn fans may be matched only their arch-rivals, the University of Alabama. Remember the Toomer’s Corner tree poisoning incident? Yep. That was done by a Crimson Tide fan. Indeed, Alabama fans have a reputation for low intelligence. We’re not saying that this is deserved, just stating facts. This might be motivated by jealousy, in all fairness, as the sheer quantity of their championships outstrips pretty much every single other school, with the notable exception of Princeton and Yale. Those Ivy League schools must face the music, however: the overwhelming majority of those championships were won before World War I, a drastically different (and far less competitive) time in football’s history. Never insult a man’s khakis! It’s no secret that Jim Harbaugh has a fondness for the article of clothing, and we have to admit he looks great in them. He likes them for how multipurpose they are (he even works out in them). 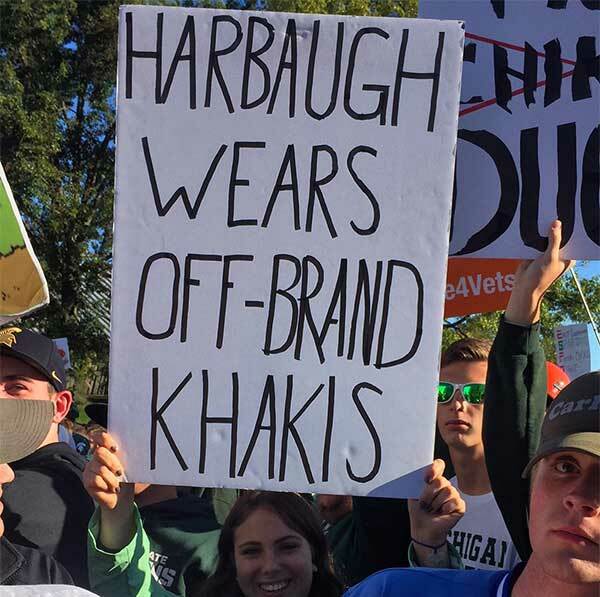 While this diss may have been true several years back, coach Jim Harbaugh has recently admitted that he traded in his $8 khakis for a much pricier brand of khakis. Reportedly, these are made by Lululemon and cost over $100! Clemson is one of the powerhouses of college football — there’s no denying it, folks. While Clemson has had deep-seated rivalries with several other teams in the south, one of the most recent ones to bud out is none other than Notre Dame, straight out of Indiana. Depending on how you count it, the Fighting Irish have the same number of championships as Clemson’s archrivals, Alabama. 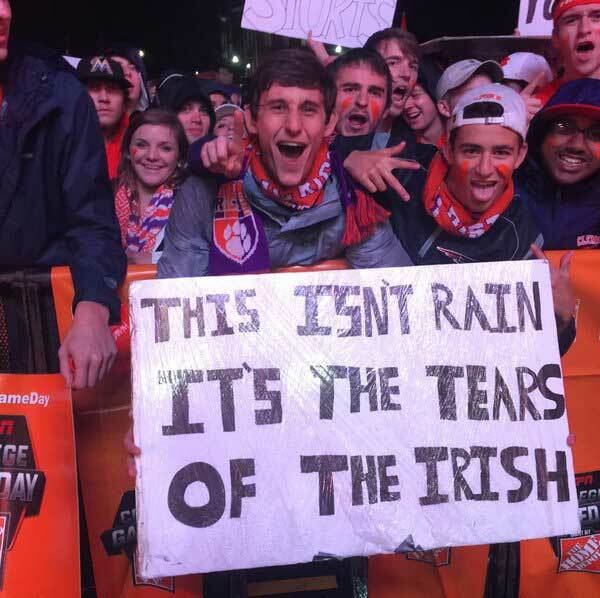 Indeed, in recent years Clemson has gone through Notre Dame on their way to crushing Alabama underfoot. 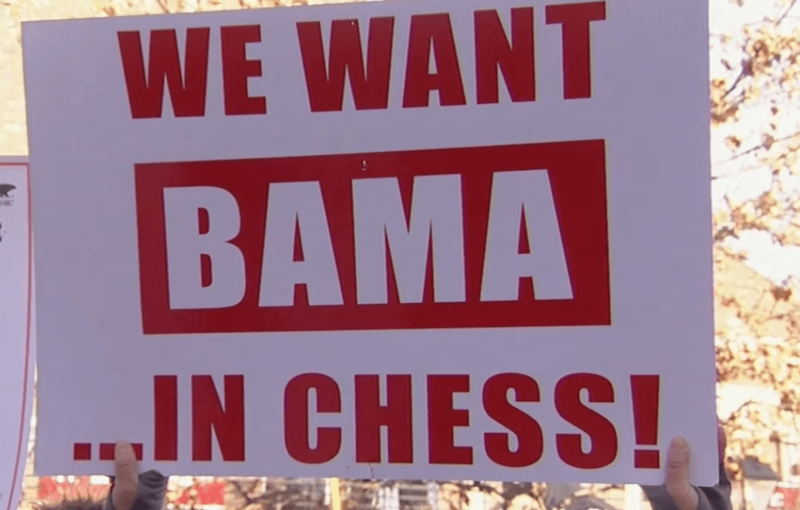 Recently, ironic “We Want Bama” signs have been appearing everywhere. This challenge to Alabama, a dominant force to be reckoned with, is pure arrogance. We assure you, no one actually wants to play Bama, because the chance they will lose in the current state of affairs is too great. One Harvard fan slyly poked fun at this, bringing to mind both Alabama’s incredible record and its stereotype its fans have (rightfully?) earned for not being the sharpest tools in the shed. MSU is a force to be reckoned with, indeed. The Wolverines out of Michigan might be able to boast a better academic reputation, but (with the exception of this past season) the Spartans have simply proven they are better on the field in recent years. This success has been repeated week after week against deep-seated rivalries, as they slyly point out here. We’re not sure what the outcome was of this game, but Notre Dame actually leads in all-time matches with their northern enemies by quite a bit. 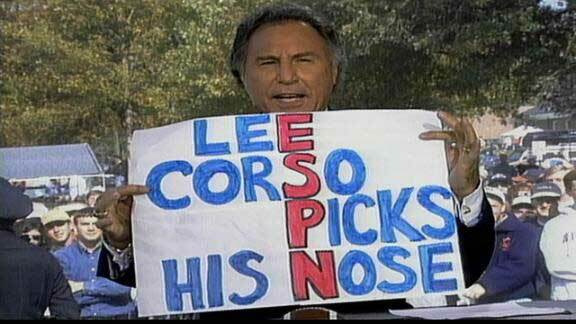 Poor ESPN GameDay host Lee Corso just can’t seem to get a break on his own show. If you pay attention closely, there are even more signs poking fun at him in this list that just happen to appear in the same picture with other signs. He’s able to take it all in stride, however, and is in good humor despite it all. We’re just not sure if we would want to touch the sign and take it back once he’s done holding it…yuck. There doesn’t seem to be a sharper contrast between the Spartan way of life in ancient Greece and Gandhi’s civil disobedience. 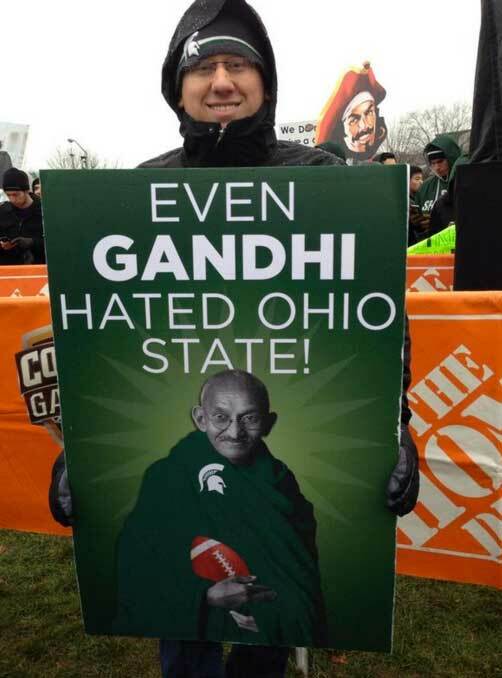 That being said, this Michigan State University fan points out that not even Gandhi liked Ohio State. Indeed, the Buckeyes are one of the few teams that have been able to derail Alabama in recent memory. They dominated the Big Ten conference last year, not to mention the year before that. It’s no wonder that the hatred for this team is so widespread. Too Old To Get A Speech Coach? Some of these stills have managed to capture two incredibly funny signs that are simply on point. But while O.J. Simpson stealing your tickets brought out some uncontrollable chuckles, the Lou Holtz one had us on the floor. With all due respect to the legendary coach’s skills in leading teams to victory, Lou Holtz sounds like Sylvester the Cat from Looney Toons. We’d pay good money to hear him say “sufferin’ succotash” five times straight. All joking aside, however, Holtz is an American hero. Michigan has raked in more wins than any other college football team in history and is now helmed by Jim Harbaugh as their coach, a proven winner in both college football and the NFL. In case you forgot, the 49ers hadn’t had a winning season since 2002 when he became their coach in 2011. He then took them to the playoffs three seasons in a row, one of which ended in a Superbowl appearance. 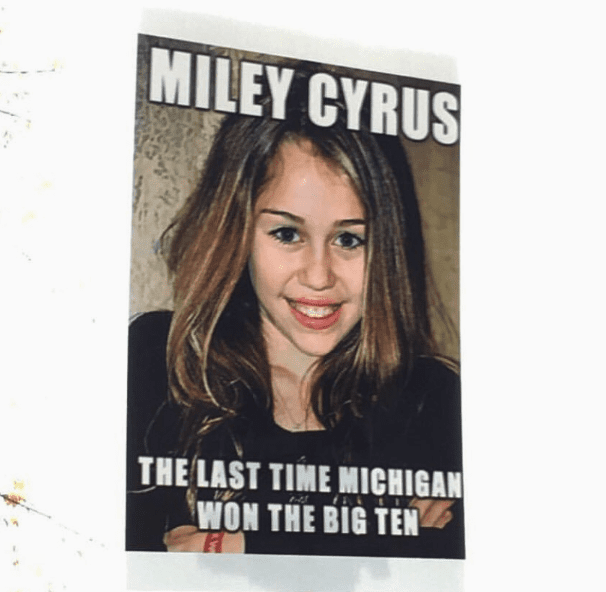 Despite this, Michigan hasn’t won the Big Ten since before Hannah Montana went on air. Yes, the stereotype about Alabama is so bad that this Texas A & M fan pointed out that even America’s favorite idiot got in. Yes, he’s a fictional character, but they say art mimics reality. Everyone deserves a shot to go to college, however hard it might be to adjust to the new social climate and rigorous education. “Maybe it’s just me,” Forrest Gump admits in the movie, “but college was very confusing times.” Not just for you, Forrest! 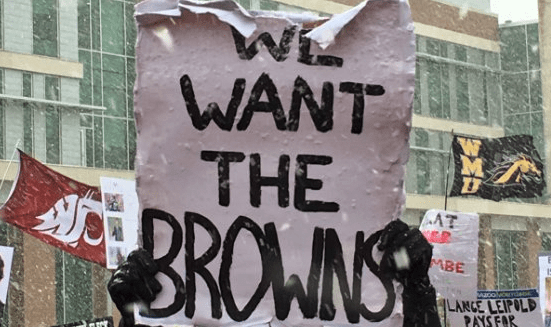 Finally, a “We Want” sign that speaks the truth. The Cleveland Browns are, statistically, the worst team in the NFL, bar none. They have had only two winning seasons in the past 20 years. It’s really sad, but there is the oft-repeated joke that the Browns wouldn’t be able to defeat the better teams in college football, such as Alabama. Maybe this challenge to Cleveland’s football team is actually a much more modest proposal than challenging the Crimson Tide to a matchup.